A cyclist passes the “east anchor” site on Water Avenue Tuesday evening. 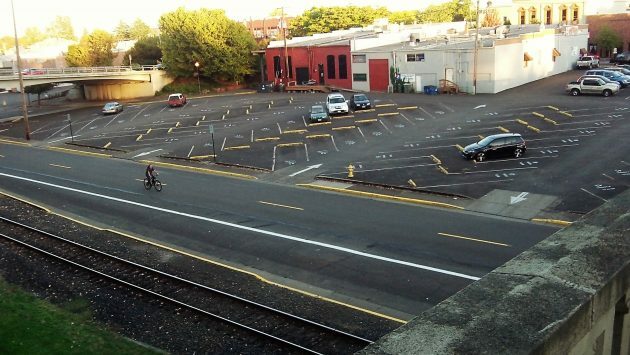 The city-owned parking lot on the south side of Water Avenue between Albany’s Willamette River bridges has about 65 spaces, give or take one or two. City Councilman Rich Kellum has an idea of how to double the number of spaces and develop the site as the “east anchor” of the downtown district’s commercial revival at the same time. Kellum is completing his first four-year term on the council this year and running for re-election this fall in Ward III. He mentioned his idea during a work session of the council Monday and said he’d bring it up again after his colleagues on the council have had time to think about it. His idea goes like this: Offer the lot to a developer at no charge in return for the developer building something on the site that would, among other things, double the number of parking spaces. That might be done by constructing a building with parking on the ground floor and the one above, and commercial spaces on however many stories it is practical and economical to build on top of that. What this would accomplish, if it worked, is to realize one important aspect of the downtown retail refinement plan the Central Albany Revitalization Area commissioned in 2011. That plan envisioned the main commercial street, a quarter-mile of First Avenue, to be bracketed by anchor developments at both ends. At the west end, the Albany Carousel is under construction. But nothing has been proposed, let alone pursued, on the parking lot between the river bridges that is designated in the plan as the east anchor. Kellum mentioned his idea to me after he read last week’s story here headlined “What about the east anchor.” In the comment section, the story prompted another suggestion from a reader who proposed turning the site into a permanent farmers’ and craft market that would allow market days to be held more than once a week. It sounds interesting but would subtract downtown parking spaces rather than add them. With 6 cars in your picture, is that the site where the parking is needed? Or would it be better more centrally located between the east and west anchor sites? Bob, the thought is that there are a number of sites that the city owns, by using multiple sites along water and even two rivers market lot, the parking is built, it is dispersed, the taxpayer does not have to foot the bill, downtown is enlivened, the taxpayer does not have to build a parking structure, did I mention that the taxpayer doesn’t have to pay for it? Oh yah I guess I did. The obvious incentive for a developer is the minimal cost of the property. Not sure “free” is wise, but that’s TBD. Regardless, it would still have to pencil-out for a developer to tackle it. Personally, I think having the “commercial” spaces on the top floor would be a death knell. Put the parking on top, commercial on the bottom for foot traffic to also access those business to generate revenue for the owner. The parking structure itself will do zilch to that end. Downside is the in/out process for parking on top would also raise the cost… LOTs to think through for sure…. Parking in a basement, More on the alley side over the alley, with commercial on the front.. offices upstairs, or residential, or a boutique hotel bridging water Ave. Developers thinking about it will bring in the ideas.. I kind of agree with Ray here, stores on 1st floor encourages folks. However, not knowing what the cost of a structure is with parking on bottom vs parking on top, I’d withhold making that a requirement. C’mon Rich you’ve been a Republican for all your life. You CLEARLY know that the Taxpayer ALWAYS pays. If not directly through taxes and fees, they pay through the price of the products and services they buy. You Elephants have been repeating that mantra since well before I was born. ON the other hand, land that the public owns belongs to them. They can decide how to use it and how to pay for it. If you GIVE AWAY public property you’re just lining the pockets of a few individuals at the Taxpayers expense. Not to mention the fact that the public has property that fronts directly on public park land across the street. That’s a two-fer that maybe could mean big things in the near future. It is quite common to lease property to businesses. In fact, a significant chunk of downtown is owned by absentee landlords who lease their property to the private sector and government. They do it because they make $$$$ on the lease plus the appreciated value of the property over time. So why can’t the public make them bucks too! Is it because you’re so invested in crony capitalism that you can’t wait to GIVE PUBLIC PROPERTY AWAY to your supporters? The right thing to do is to make sure that the PUBLIC benefits from the property THEY own. Of course your party is willing and able to TRUMP the public any way they can. LOL….this is exactly what CARA does with its grants and forgivable loans to wealthy individuals and developers. Never heard Bob complain about those handouts, did we? And crony capitalism? LOL…again. CARA is the poster child for crony capitalism. Bob, you sound just like Hillary and Trump – talking out of both sides of your mouth…LOL. No Gordon, I sound like YOU! You ever hear of sarcasm? Your guy Trump lives by it, doesn’t he? It’s the same crap you conservatives have spouted for years. Rich want’s to give away public owned land to get a “free” parking garage. No sane businessman goes into a proposal stating that he will give away something for nothing. You ask for a high price and then negotiate downward. You don’t start at capitulation. 6 cars. That’s what Hasso’s picture shows. Do you think he was looking for the least used day of the year? No, it was just a random day. Every time I ever went by it it looked much the same. So here’s some free land if you build us a parking garage with double the current capacity, that hardly anyone currently uses? Where is the demand. If you build it they will come??? The best bet that I see that could to do that might be a Casino. We would be giving the value of the property away in exchange for twice as much parking, in structures that the taxpayer does not have to pay for, the property goes back on the tax paying side of the ledger, it would also spread out the parking more than a single parking structure does if we did this in more than one spot. (two rivers) (JC Penney). Think outside the Box here.